March 2014 – Page 89 – Welcome to Wyandotte Daily! The Kansas City Kansas Community College Board of Trustees will meet at 3:30 p.m. Tuesday, March 11 at the Upper Level Jewell building on the KCKCC campus, 7250 State Ave. The agenda is at http://www.kckcc.edu/Media/Website%20Resources/pdfs/bot/2014/BOT_MAR11_2014.pdf. The National Alliance on Mental Illness, Kansas City, Kan., Support and Education Group, will meet from 7 p.m. to 9 p.m. March 10 at Trinity Community Church, 5010 Parallel Parkway, Kansas City, Kan. The speaker will be Gerald Ulrich, on the topic, “What About NAMI Keeps Me Involved.” The group is for consumers and families, bringing together people who have questions about mental illness. 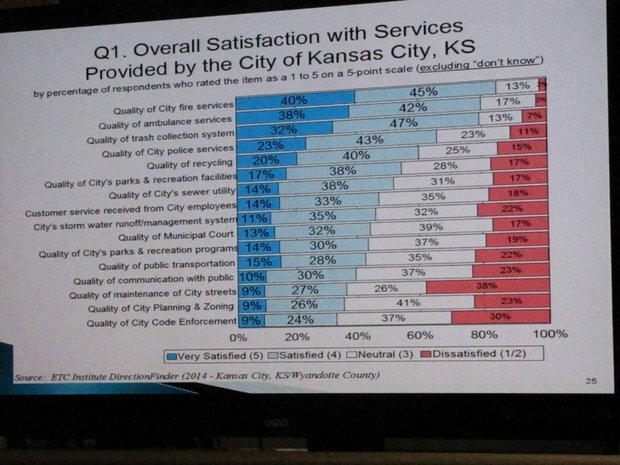 Satisfaction with city services was shown on this chart from a citizen survey. A very active Unified Government Commission faces unique budget challenges this year. In a meeting Saturday at City Hall, commissioners heard a variety of information that may help them sort out their budget issues and make hard decisions on cutting and funding programs. Topping their list of budget considerations was holding the property tax level. At the same time as holding down the property tax, they will be trying to increase the UG’s fund balances. They learned Thursday night that one of the ratings agencies, Moody’s, may decrease their bond rating if they do not increase the fund balances. A lower bond rating could lead to increased spending in the future on debt service. Another bond rating service, S&P, has given the UG a higher rating than Moody’s. On Saturday, commissioners also discussed being on the hook for a new $25 million radio communications system approved by a former UG commission. Those funds have already been spent and the payments will come from the county side of the budget, they were told. The commissioners are discussing their budget priorities and will present them to the administration on March 20. New Administrator Doug Bach thanked the commissioners for their ideas and said at the end of the lengthy meeting that it appears that the first priority will be to cut $1.3 million out of the operating budget, given the commission’s priority to hold down property taxes. Mayor Mark Holland suggested targeting overtime and out-of-class pay to hold down costs. The UG is spending $6.5 million in those costs, the budget director reported. Those funds could be used to help pay for the increased fund balances and also for the new radio system, according to UG officials. Mayor Holland also remarked that perhaps valuations would go up, while the mill levy would be held steady. The mayor has supported increased data-driven decisions to find efficiencies. Commissioner Ann Murguia long has supported using community surveys to rank spending priorities. Commissioners are delving into budget details through several committees. Commissioners are studying the budget requests from the community in detail, going over them in a committee. A citizen survey presented Saturday by Chris Tatham, executive vice president of ETC Institute, will help the commission rank these requests according to the priorities listed on the survey. Citizens are most interested in better streets, according to the survey, but in recent years, the UG has cut the funding for street maintenance. Other priorities listed by the survey, for improving city services: code enforcement, communication with the public, public transit and police. The top priorities for the county services included aging services, motor vehicle registration services and parks. The three most important community issues included safe neighborhoods, schools and jobs. There was also strong support to do more to promote economic development, the survey found. The budget is still in the discussion stage, and none of it is final. The commission began studying the budget months earlier than it did last year.